One of the more arcane things I am mildly interested in is The Bomb, most likely due to being an impressionable pre-teen in an era when it's use was considered a strong possibility (how I never learned to stop worrying and love The Bomb is another post in itself). While not a lay expert by any means (probably a good thing), I do know a public-domain bit about how they work, how they might be used, and their history. Which is why it was nice to see a story last week (link) about a quietly ongoing long-term process to get rid of a few of them, with the dismantling of the last B-53 gravity bomb in the US stockpile. While I am interested in them, I am not in love with them either. They are too scary, and stockpiles being ever reduced in the post-cold war era is a good thing for all of us. The active warhead numbers quoted in the article are still too high, but are now only moderately insane, in comparison to the full-tilt barking levels they attained at the height of the arms race a few decades ago. While missiles are arguably flashier and higher tech, old fashioned free fall bombs still remain in service (and will be for the foreseeable future), not least because a bomber carrying one can be recalled; once a missile is on its way, you had better be sure you made the right decision to send it :). The B-53 from what I can tell was intended to be used as a bunker buster, delivered in what is called a laydown attack by an aircraft flying directly over the target, with a descent slowed by parachute to give the aircraft time to escape. Detonating on the ground, the 9 megaton warhead would generate shockwaves or dig a big enough crater to destroy whatever was below it. An identical size warhead probably intended for the same purpose used to be mounted on some US ICBMs. Contrary to some popular beliefs, while the strategic weapons deployed today are many times as powerful as those used against Japan in 1945, the trend for some time has been for warhead yields to decrease, as delivery systems got more and more accurate and reliable. 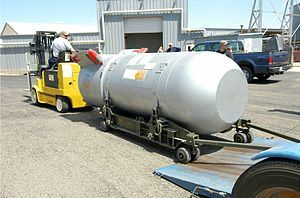 The two atomic bombs used in anger are estimated to have yielded roughly between 12 and 20 Kilotons, while modern warheads seem to range between around 100 Kilotons to around 1 Megaton (Kiloton = 1000 tons of TNT, Megaton 1,000,000). At 9 Mt, some sources have been referring to the B-53 as a 'Monster' size weapon, but in a historical context it isn't really. While it does represent a certain class (big) of weapon and for some time it was the most powerful weapon in the US arsenal, it isn't the biggest they ever fielded. That was another long retired gravity bomb, the B-41, rated at a theoretical 25 Mt (theoretical because it was never live tested at that size). In addition from what I can gather the Russians had a few 20 Mts warheads deployed on ICBMs until as recently as a couple of years ago, and fielded a few 25 Mts back in the bad old days. Hiroshima and Nagasaki were bad enough, but the sheer power of larger weapons like these is hard to comprehend, especially when it is reasonably likely that had they ever been used there would likely have been more than one arriving at a target to ensure its destruction. In all the reportage about the B-53 dismantling, the significance of the particular date seems to have been missed. Fifty years ago, in late October 1961, the largest bomb of them all was exploded. 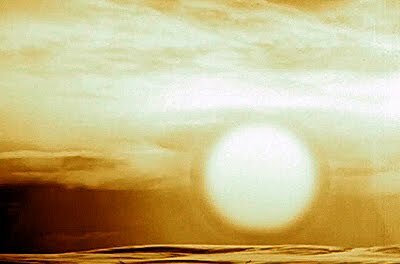 Too large in every respect to be a usable weapon, the Tsar Bomba was created as a propaganda stunt by the Soviet regime, pretty much because they could. The weapon was capable of a mind-bendingly Strangeloveian 100 Mt, but was scaled down to a merely surreal 50 Mt for safety reasons (allowing the aircrew on the delivery aircraft to survive, and not causing blast damage to or irradiating nearby countries mostly. Doesn't look like much, until you remember the diameter of that fireball is measured in kilometers (about 8 according to most sources).